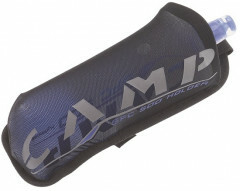 Once again acting as the glue between your pack and hydration, CAMP now offers to hold your soft flasks. If you’ve made the switch to squeezable fuel, you’ve probably found that rigid bottle holders just won’t do. These 500ml elastic mesh holders attach to your pack with Velcro and lovingly cradle your water, gel-water, or water-gel. Simply uncradle, point at your fuel-hole, and squeeze. Flasks sold separately. Will y'all be getting this back in stock soon? Hey Stevo! Oh man! Can't believe we're out of stock in these. We'll get some ordered right away and I'll send you an email once they show up! When will you be getting more 250 ml flask holders in? I will order the 500 ml for the larger size flask I have in the meantime. Hey Anne! Just saw your order come through, it's headed your way! To our knowledge, the 150ml Soft Flask Holder is discontinued from here on out, unfortunately. will the larger 500ml hold the 250 size flash secure enough? thanks! Yeah, but the 250ml flask will be swimming inside the pocket and "quick access" isn't a word I'd use to describe getting the flask in or out of the pouch. I've been using soft flasks for a while now to fuel my adventures and up until recently have just clipped them to my backpack shoulder straps. While convenient, they bounced around an awful lot and were kind of annoying. This little guy fixes the problem. It attaches to your shoulder strap with a vertical Velcro loop at the top of the bottle holder and a horizontal loop around the middle. Once attached it feels pretty solid. I have a couple Hydrapak SF500 soft flasks and this holder accepts them, although begrudgingly. You can tell it was designed for the soft flasks that are longer and narrow and that don't have a rigid bottom, like the Salomon and Camp varieties. As such, my larger flasks are a tight fit but it still works. It appears that it'll hold up alright but the front is stretch mesh and I'm sure it'll tear if abused too much. In summary, this is a handy and inexpensive way to keep water and fuel close by. Any idea if the larger flask holder would accommodate the Hydrapak SF500 with the wider, more rigid plastic top and bottom? Thanks. Hi Jeremy, unfortunately we don't have one to test.